Saturday night, the Leave it to Cleavers took on the Death Dealers which at least in the minds of the Cleavers has been the roller derby bout that could be the bout of the season. The Cleavers came out strong, playing smart defense and our jammers did an amazing job getting through the pack quickly to earn lead jammer status. The score was as close as 3 points in the first half and as wide as 30 in the second half with the Cleavers leading the entire game. The Cleavers got into some penalty trouble at the end of the second half and allowed the Dealers to go on a 34 to 6 point scoring run in the last 6 jams. But the Cleavers ultimately held tight and managed to hang on and win with a 9 point lead. A special thanks to all my family and friends who came out to the Oval to cheer us on! 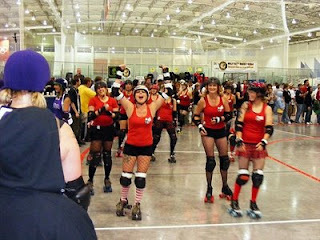 Next up, the league championship game against the Bomber Babes!